The Island is a sci-fi hodgepodge that, like its cloned protagonists, is nothing more than a collection of parts pilfered from other, better, movies. It’s a black and white world in the year 2019. All the uniforms worn by the citizens of The Island’s hermetically sealed, post-apocalyptic environment are black and white, with a dash of gray here and there. Plus the drab, clinical confines in which they live are Spartan white enclosures that lead to bland white hallways. These monotonous environs in director Michael Bay’s latest opus make the obvious product placement for a popular brand of bottled water and other name brands all the more glaring and obnoxious. They also make for an early tip-off that not everything is as it seems — could the characters living in a self-contained world still get famous-name sneakers? But obnoxiousness and obviousness are two hallmarks of a Michael Bay movie, considering he’s the man behind the studfests Armageddon and Bad Boys. At least at the beginning of The Island Bay tries for something along the lines of a thriller and for a (brief) while it seems like there was a certain amount of thought put into the story. The well-meaning survivors of some sort of global holocaust all pin their hopes on winning the lottery, which means winning an exit visa to go to the Island, a fabled place where men and women get the opportunity to repopulate the Garden of Eden. It’s not too much of a surprise that the lottery doesn’t really deliver exactly what was promised. At the center of the story is Lincoln 6 Echo; every move he makes, every breath he takes is being monitored by computerized gadgets; digital screens adorn his room’s walls and dictate his next move; pleasantries, doctor visits, and the like are all dispelled with the cold impersonal touch of high technology. It’s no wonder Lincoln (Ewan McGregor, Big Fish) is discontent with his life and habitat, even though he should consider himself lucky to be alive in “the world’s last pathogen-free zone.” He’s inquisitive and encourages his friends to think for themselves rather just be happy to have a job and a cup of water. However, what Lincoln should feel above all else is a sense of déjà vu. After all, there’s nothing in The Island that hasn’t been done before and to far greater effect. The first half-hour in particular feels ripped out of the world of THX-1138, the student film made by George Lucas that he in turn remade into a feature length film way back in the ’70s. Making matters worse, The Island is actually a remake of The Clonus Horror, a piece of 1979 sci-fi vomit. Spoiler warning: this section may contain spoilers. Lincoln’s questioning of authority leads to inevitable troubles. Branded as an infected specimen to be caught and quarantined, Lincoln makes a run for it with his platonic girlfriend, Jordan 2 Delta (Scarlett Johansson, Girl With a Pearl Earring). Once they manage to escape the compound (once again like THX-1138, it involves climbing up a ladder), the story sinks faster than the Titanic. Out in the “real world,” Bay reverts to his old devices: black helicopters, “former” Navy SEALs, lots of guns, lots of flashy cars, lots of car chases, and lots and lots o’ stuff that adds up to a whole lot of nothing. No matter what profound statement this pile of tripe might be trying to make about the life-and-death morals of cloning, it all gets lost in Bay’s hogwash brand of storytelling and gratuitous product placement. The Island even plugs a magazine for boys who think they’re men, no doubt this movie’s target audience. As the action sputters out in a blaze of Bay glory, the story degenerates into an uninvolving exercise of the all too familiar. Parts are ripped from Minority Report, Logan’s Run, Blade Runner, I Robot, heck, even Tron gets something of a nod in this mélange of cinematic references. Caspian Tredwell-Owen’s story suffers the same fate as his Beyond Borders, a foreign aid drama that also trashed its potential and devolved into a spineless Harlequin romance. Likewise, this cloning thriller throws away its aspirations to political and social commentary for stupid action sequences. Living forever, we are told, is the new American dream and cloning is the big business answer to providing backup organs for those who can afford it. It’s inevitable that Lincoln meet up with his progenitor in the real world, a futuristic Los Angeles that does indeed look like a pretty cool place to live. A mere 14 years from now the place will have undergone a major face lift. Some of the film’s special effects are indeed decent, but for every cool bit there two sloppy shots. 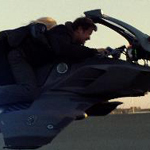 The topper is an incredibly cheesy motorcycle chase through Los Angeles reminiscent of the speeder bikes scene in Return of the Jedi; similar, but those speeder bikes were more exciting. Amidst the nonsense, the film forgets to deliver sympathetic characters. Theoretically, audiences should care about the clones, but it’s hard to sympathize with grown adult clones simply because they have the mental capacity of 15 year olds and look at things with wide-eyed wonder. It’s also hard to sympathize with the main protagonist, non-clone division, McCord (Steve Buscemi, Con Air), because he’s married to a woman who is simply far too hot for him (remember that magazine for boys who think they’re men; this movie shares the same IQ as well). Through it all, and to their credit, the cast does a valiant job of attempting to make something out of nothing. In particular, the three leads, McGregor, Johansson, and Sean Bean (The Lord of the Rings trilogy) are quite watchable, but they don’t have enough material to work with for the film’s overlong 127 minutes. Their talents were better used elsewhere; for this one, they should’ve sent in their clones.